As caught up as so many of us are in the quotidian, a historical novel seems hardly relevant. Yet, NPR All Things Considered book critic Alan Cheuse has managed to write an epic that is exquisitely appropos; in his newly released Song of Slaves in the Desert– A Novel of Slavery and The Southern Wild — Source Books 2011, he gives us the issues of ethnicity, race and freedom in a new, eloquent light. 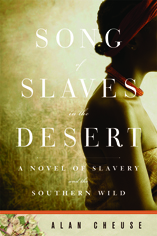 Song of Slaves in the Desert begins with the searing account of a sheik warning his slave of his impending sale, that slave’s attempt to escape with his family, and capture. Meanwhile, in mid-nineteenth century New York Nathan Pereira is a young Jew sent by his father to Charleston to monitor family interests. So it is that histories collide and the colorful protagonist, delivered to the reader in a remarkable first person assemblage of detail, begins to confront how it is and why it is that Jews, themselves the indisputable victims of history, came to possess African slaves in the antebellum South. Histories intertwine when Pereira encounters the beautiful Liza, descendant of the desert slaves, crossing an heretofore unbreachable boundary. It is a daunting task to explore the twists and turns of history, to sift through to find narrative threads and weave them together. Writing such a book is tantamount to archaeology: you have the bones, then the flesh and then the emergent story with its revelations. Cheuse paints a world that draws the reader in to come face to face with great disparities and conundrums, his characters justly fallible and ignoble and yet who are redeemed, as we hope we all are, by their efforts to overcome and come to terms.